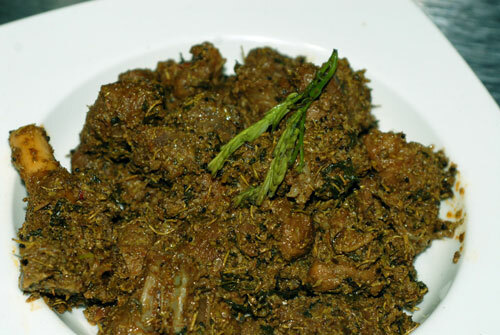 Heat oil in a hundi, crackle garam masal whole, add curry leaves, green chillies and onions and fry till brown. Add ginger garlic paste and saute for few minutes. Add all the masalas and fry. Add chopped tomatoes and coconut paste, cook for a while and add cleaned and washed mutton pieces and add stock or water and salt. Cook again for 15 minutes and add the tamarind leaves. Cook again for 15 minutes or till the mutton pieces become tender. Serve hot garnished with chopped coriander.